Living on the lake has always been an adventure. Quiet ponds and tranquil lakes create a storybook setting that is almost magical for some residents. Neighbors can go canoeing together or spend a weekend fishing. In the winter, you can go ice-skating. And every time you look out your window, the lake will be there to dazzle your eyes. The aura and community lakes in Ann Arbor create is an experience that lasts a lifetime. 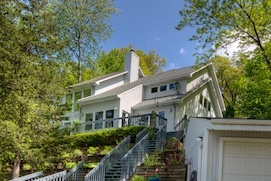 This is an outstanding two-story contemporary home with 70 ft. of lake frontage on Island Lake. Beautifully updated home with a quartz center island kitchen with all appliances. The dining area has access to large multiple level deck, great views and wonderful place to relax. The great room features a wood burning fire place and volume ceiling. Gleaming hickory floors throughout the first level. There is a first floor guest bedroom with access to main bath. The second floor boasts a master suite with spa tub, separate shower and tasteful decor. An inside balcony overlooking the great room and gorgeous views of the lake is a place you will never tire of relaxing to. The large third bedroom could easily fit 4 beds, plenty of space for guests and residents alike. The dock and pontoon boat are included in the sale. Island Lake is a 100 acre no wake, spring fed, private lake. Residents enjoy the serenity of nature: Great Blue Heron, Sand Hill Crane and even a pair of Bald Eagles. Island Lake is located in the 20,000 acre Waterloo Recreation Area. You will be just 12 minutes away from Chelsea, Michigan and just 30 minutes away from Ann Arbor and the U of M. This lake is a jewel; beautiful and rare.